Police have fired tear gas to disperse hundreds of doctors striking in the Kenyan capital Nairobi. The medics, wearing white gowns and surgical caps, were demanding the government honour a 2013 deal to increase salaries. Dozens of mental health patients were said to have walked out of a hospital in Nairobi during the strike. Officials say the action is premature and negotiations should continue. 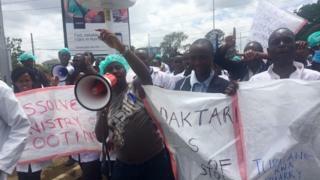 They say doctors have defied a court order suspending the strike until the end of this month to allow for more talks. But the Kenya Medical Practitioners Pharmacists and Dentists' Union (KMPDU) said it had run out of patience after government commitments failed to materialise. "We have had lots and lots of diplomacy, and lots and lots of dialogue. Dialogue has to come to an end," union chairman Samuel Oroko said. About 5,000 medical staff in more than 2,000 public hospitals stopped working at midnight on Sunday. Hospitals would not offer even emergency services during the action, the union said. A BBC correspondent says this puts thousands of lives at risk because many Kenyans cannot afford private medical care. At one hospital in western Kenya, a reporter with the Daily Nation newspaper heard a nurse tell a crying woman in labour to go and see the county governor. Under the Kenyan system, counties are responsible for paying some medical staff. Meanwhile, at least 50 mental health patients at the Mathare mental hospital in Nairobi were reported to have left the facility amid the chaos of the strike. Video posted on the website of the Standard newspaper appeared to show patients climbing over hospital walls and walking away. Medical staff want a deal signed between the Kenya Medical Practitioners' Union and the Kenya government in 2013 to be implemented. The agreement included a 300% pay rise for doctors. The doctors' union also says it wants more medics hired to reduce the doctor-patient ratio, currently one doctor for more than 16,000 Kenyans. "We have a big shortage of doctors yet our counties are sending doctors away, saying they cannot hire more doctors," union representative Gitau Kagona told the Daily Nation. "We cannot have good service delivery in hospitals because of this challenge." Why are doctors talking about corruption? Some medical staff brought empty sacks to an event marking the beginning of the strike, a reference to money paid under a controversial government tender to a businesswoman, who reportedly carried it off in a sack. They also launched a social media hashtag - #LipaKamaTender - which roughly translates as "pay like the tenders", implying the state should pay their salaries as efficiently as it pays government tenders. How common are such strikes in Kenya? There have been protests and isolated strikes from various medical practitioners in parts of the country over the delay in raising salaries. However this is the first nationwide strike on the issue. The doctors' decision not to offer emergency care follows a similar approach taken by medical staff during a week-long strike in Burkina Faso last month, when medical students and army health workers were brought in to offer treatment.